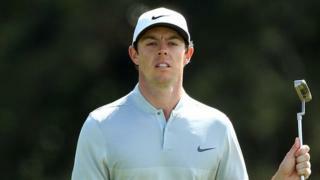 Northern Ireland's Rory McIlroy says he is "happy with where he is at" as he prepares for the final two rounds of the Masters at Augusta. The world number three carded a 71 in his second round on Friday to lie one shot behind tournament leader and defending champion Jordan Spieth. "It's been a few years since I was in this position at the Masters, going into the weekend with a genuine chance of winning, but I have prepared as best as I can," said McIlroy.